HOLIDAY GIVEAWAY | Enter to WIN our Best Selling, Fall Favorite: The Leopard Flat! Have you been dreaming in leopard lately? Seeing spots no matter where you look? Well you're in luck! From now until Sunday, we're doing a Holiday Giveaway in which one lucky winner will receive a brand new Hipsters for Sisters Leopard Flat belt bag! Simply "Like" the Hipsters for Sisters' page on Facebook and comment on this photo with the code word "Leopard Flat" to be eligible to win. P.S. "Share" the photo to double your chances of winning. 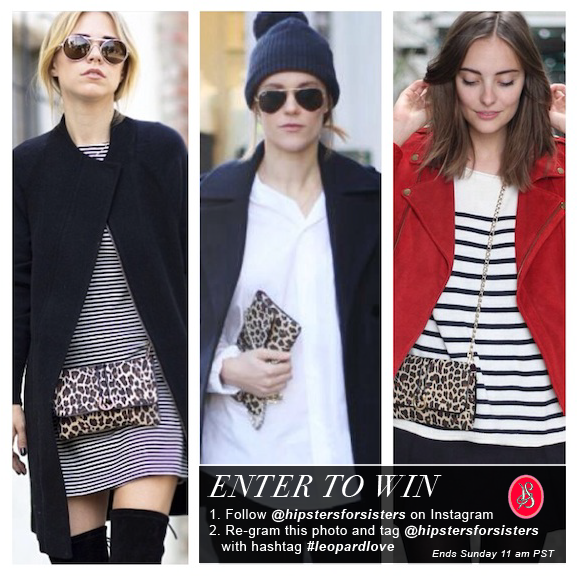 "Follow" @hipstersforsisters on Instagram and re-gram this photo with the tag @hipstersforsisters and hashtag #leopardlove. Contest ends Sunday 11 a.m. PST. Winner will be selected at random from all entries.